Jackie Morgen ’13 employed integrated media design in her senior dance performance. As she performed live on ballet barres, a projected image of Morgen appeared in the background. Photos by Laurence Kesterson. It’s late April, and the Freer Ensemble Theater is dimly lit but very alive. Actors limber up onstage, doing the hokey pokey, while the whomp, whomp of live drumming down the hall offers ambient sound. 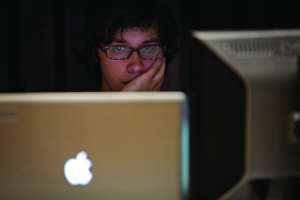 Fernando Maldonado ’13 sits, hands resting on his laptop keyboard, staring intently at a small, blank screen suspended above the stage. Beside him is Matt Saunders, assistant professor of design and adviser for Maldonado’s independent study in integrated media design. Maldonado serves as projection designer for Meryl Sands ’13’s ensemble-created magical-realism piece, Unstuck. Saunders is her set designer and independent-study adviser. Three days before Unstuck’s debut, Maldonado and Saunders are stumped by a failure in technology. “The problem may be a preset,” offers Saunders. “I haven’t had trouble with it the last few days,” says Maldonado. “Can you throw another cue?” asks Saunders. A few minutes later, the troubleshooters gaze at the screen, which now depicts an attic window framing a blue sky and tree. “Ah, that’s more poetic,” says the professor. From 6 to 11 p.m. every night this week as the May 3 show time approaches, teacher and student trade dialogue about lighting cues and software glitches and cue their computers so that the on-stage projections sync with the live actors’ movements. Earlier this day, they worked with Jackie Morgen ’13, a slim and flexuous aspiring physician who’s majoring in biology and has a special major in circus arts—her hobby since she was 8. Maldonado and Saunders created the projection design that is an integral element of Morgen’s senior dance performance. In March, they followed her to Philadelphia to film her twirling on a teal aerial silk, a length of fabric suspended from rigging equipment. Today they are working to project footage of that vertical performance behind her live performance on a horizontal plane—two ballet barres set 4 feet off the ground. Maldonado hovers over his keyboard, Morgen on one side, Saunders on his other. They’re puzzling over the images of her spiraling on the fabric against a white backdrop—which, to Morgen, look too harshly edged. 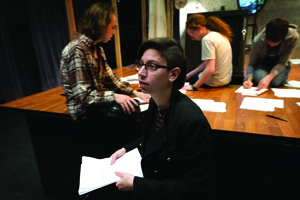 Meryl Sands ’13 (foreground) rehearses the cast of Unstuck, a devised piece, developed through collaboration with the performers. “I just don’t want to see three colors,” says Morgen. 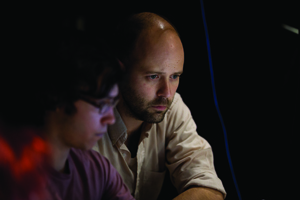 Integrated media design for theater—incorporating computer-generated images into live performances—is what Saunders and Maldonado have spent so much time doing this spring. It is increasingly a key element in professional theater and dance productions—from experimental work to Broadway and the Metropolitan Opera—but not so often on a liberal arts campus, according to Allen Kuharski, Stephen Lang Professor of the Performing Arts and chair of the theater department. One night a week, Sugg took the train from New York City—where he’s established himself as a sought-after projection designer for Broadway, Off-Broadway, and innovative downtown theater—to Swarthmore to teach the three-and-a-half-hour class. “I suspect we were among the first colleges to offer integrated media design in the undergraduate theater curriculum,” says Kuharski. Lars Jan ’00, a director and digital-media designer, taught the class after Sugg, then in 2011, Saunders came on as a permanent faculty member teaching traditional design courses as well as integrated media design. Matt Saunders (right) works with Fernando Maldonado ’13 on Unstuck. Further demonstrating its interdisciplinary nature, starting next year, Integrated Media Design for Live Performance will be cross-listed in film and media studies as well as dance. Thanks to Saunders’ presence, “we now have current students [like Maldonado] working with faculty to establish the kind of skills that Jeff Sugg is using on Broadway,” says Kuharski. Offering integrated media design aligns with the College’s commitment to interdisciplinary curricula. Besides students like Maldonado, who is majoring in film and media studies and English literature, the courses often attract art and engineering students, according to Saunders. Maldonado, who developed his video skills at New Jersey’s Peddie School, came to Swarthmore intending to study political science, but his love for filmmaking won out. During his four years at Swarthmore, he’s used his video expertise by working in the Media Center and shooting instructional videos for career services, admissions, the dean’s office, and facilities management. Just a year ago, a friend asked him to do the animation for a theater performance, and two independent studies with Saunders later, Maldonado is seen as a go-to guy on campus for integrated media design. Maldonado has now created digital media for four shows—a fall theater-department production with Sands, which used three projectors, and this spring, a drama-board production of Macbeth, using four projectors, Sands’ Unstuck, which employs two, and Morgen’s circus-arts dance performance, which uses one projector. For the latter performance, Maldonado and Saunders spent three hours filming Morgen, whose elegant swoops support her claim that “I was born with the ability to do splits.” They distilled the footage to four minutes for her finished stage show. Fernando Maldonado ’13, projection designer for Meryl Sands ’13’s directing thesis project, was integral to “the best team ever,” says Sands. Although filmmaking is still his ultimate aim, Maldonado hopes to continue working in the theatrical realm after graduation. But even if he only works in film, he will use the integrated team approach that taught him to serve the story line. Rather than superimposing the digital media right before a show goes lives, Maldonado has learned how the media can evolve as a production takes shape. While projections have been used to integrate filmed images with stage productions since the dawn of cinema, video projection has been increasingly used in theater in the last 20 years, due to the increased affordability and accessibility of hardware and software, Saunders notes. Just as Saunders describes Sugg as a leader “in pushing the boundaries of theater by using media in a very integrated way,” he aspires for Swarthmore’s theater department to be a boundary-breaker on the liberal arts stage.